This was my Dad’s favourite dessert, and one of the first things I learned to bake after I mastered cookies. It took a mighty leap of faith as a youngster to roll that sponge, but my Dad gave me such glowing compliments on how good it looked and how wonderful if tasted that I was encouraged to master other recipes. Daddy’s favourite fillings were raspberry jam and lemon curd, but you can use whatever strikes your fancy. Let the egg whites reach room temperature in a large bowl (they will whip better if not cold). Grease a cookie sheet with sides, and line the bottom (not sides) with parchment or waxed paper, then grease slightly again. Beat egg whites at high speed until soft peaks are formed. Gradually add ½ cup sugar and beat until stiff peaks are formed. In a small bowl, beat egg yolks till thick. Then beat in ¼ cup sugar, vanilla and lemon peel and mix until thick. Using a whisk, gently fold the yolk mixture and the flour mixture alternately in portions into the egg whites. Do not overmix, but make sure everything is combined. Spread mixture into baking pan evenly. Bake 10-12 minutes or until surface of sponge bounces back when touched lightly. Lay out your clean dish towel and dust liberally with icing sugar. Loosen the sides with a sharp paring knife. Invert sponge onto dish towel. Peel off paper and trim edges if necessary to make them even. WORKING QUICKLY (it’s OK, even if it splits a bit – the filling will hold it together) roll up the sponge in the dish towel, starting from the short end and tucking a bit of towel inside the edge to start. Let the sponge cool on a wire rack until completely cool. Unroll cooled sponge and fill with your choice of filling. NOTE: Don’t spread the filling all the way to the edges, as it will spread out as you roll the sponge. Re-roll the filled sponge gently, lifting the first edge a bit to get it going. 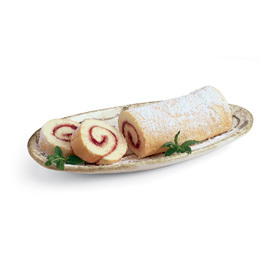 Place your completed jelly roll on serving platter, edge down. Decorate platter if you like.